On 13th May 2012, Lok Sabha and Rajya Sabha are completing 60 years of their first sitting. 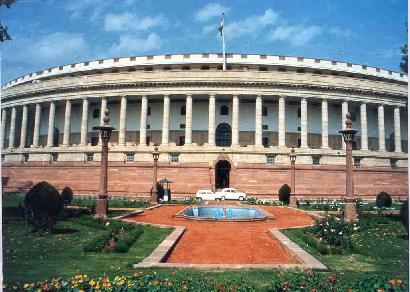 On this occassion, Parliament Secretariat has organised a special sitting on 13th May 2012 (Sunday). President of India will join a celebration and honour two Parliamentarians who were the members of the first Lok Sabha. Let us be proud of our great democracy, our great Institutions and founding fathers of our nation. I will quickly take a tour of the happenings of those days. for the benefit of younger generation. India got Independence on 15th August 1947 from British rulers. The Constituent Assembly adopted the Indian Constitution on 26th November 1949. Indian Constitution came into effect from 26th Jan 1950 and this day is being celebrated by us as Republic Day. The Constitution provides for a Parliamentary form of government which is federal in structure with certain unitary features. As per Article 79 of the Constitution of India, the council of the Parliament of the Union consists of the President and two Houses known as the Council of States (Rajya Sabha) and the House of the People (Lok Sabha). The Constitution provided voting rights to all Indian citizens, who had completed 21 years of age to elect their representatives for Lok Sabha. Article 324 deals with the appointment of Election Commission and its duties. Election Commission was formed on 25th Jan 1950 ( a day prior to Republic Day(. The first Chief Election Commissioner Mr Sukumar Sen, an Indian Civil Service Officer (now renamed as IAS) took charge of the Election Commission on 21st March 1950 with the mandate of conducting the first General Elections of Republic of India. Being the first General Election of India with new voters, the Election Commission had a challenging task of preparation of voters' list, designing election symbols for political parties, preparation of ballot papers and ballot boxes, identifying polling stations, training the officials, etc. Along with the General Elections for Lok Sabha, the Election Commission had to conduct elections for State Assemblies too. Though everybody talks about various people, who were part of the Constitution making, Constituent Assembly, First Lok Sabha, the country has practically forgotten the great services rendered by Mr Sukumar Sen, the first Chief Election Commissioner of India, who had set the trend for Indian General Elections. Today, Election Commission is one of the proudest organisations of India and even the developed countries are taking advice from Indian Election Commission. The seeds were sown by him. The first General Elections of India was held throughout India from 25th October 1951 to 21st Feb 1952. At that time India had 176 Million voters, of which 85% were illiterates. Elections were held for 489 Lok Sabha seats in 401 Constituencies spread over 26 States. At that time, few constituencies had two Members, providing opportunity for SC/ST candidates. 314 were one member Constituencies. 86 were two-member constituencies. Only one constituency was a three-member constituency. This system was modified from 3rd Lok Sabha. The voter turnout then was 45.7%. Based on the First General Elections, the First Lok Sabha was Constituted on 17th April 1952. Indian National Congress (INC) bagged 45% of the vote share and secured 364 seats (out of 489 seats) in Lok Sabha. They formed the Government with Pandit Jawaharlal Nehru as the first Prime Minister of India, after the adoption of the Constitution. Interestingly, some of the erstwhile cabinet colleagues of Pandit Nehru, like Mr B R Ambedkar and Mr Shyam Prasad Mookerjee formed separate parties and contested elections. Communist Party of India (CPI) bagged 3.3% vote share and secured 16 seats in Lok Sabha. They became the second largest party in the Lok Sabha. Mr S A Dange was the leader of CPI in the Lok Sabha. Bharatiya Jan Sangh (BJS) under the leadership of Mr Shyam Prasad Mookerjee secured 3 Lok Sabha Seats and 3.06% vote share. BJS was dissolved in the post emergency era to form Janata Party. Later, this group broke away from Janata to form Bharatiya Janata Party (BJP). Scheduled Caste Federation (SCF) under the leadership of Dr B R Ambedkar secured 2 Lok Sabha seats with vote share of 2.3%. This party later became Republican Party of India. Socialist Party (SP) under the leadership of Lok Nayak Mr Jayaprakash Narayan and Mr Ram Manohar Lohia secured 12 seats in Lok Sabha with vote share of 10.6%. Kisan Mazdoor Praja Party (KMPP) under the leadership of Acharya Kripalani secured 9 seats in Lok Sabha with vote share of 5.8%. These two parties SP and KMPP merged in September 1952 to form Praja Socialist Party. The First Lok Sabha commenced its first sitting on 13th May 1952, though constituted on 17th April 1952. This Lok Sabha was dissolved after 5 years i.e. on 4th April 1957. During this period the First Lok Sabha had 677 sittings and worked for 3784 hours. This is the highest record till date. The first Speaker of the First Lok Sabha was Mr G V Mavalankar. He assumed his office on 15th May 1952. The first Deputy Speaker was Mr Ananthasayanam Ayyangar. Since Mr Mavalankar died in Feb 1956, Mr Ananthasayanam Ayyangar was elected as the Speaker from 8th March 1956. Sardar Hukam Singh was elected as Deputy Speaker. Mr G V Mavalankar, set trends in the Parliamentary procedures, which is being followed even now. He is considered as 'Father of Lok Sabha'. The First Lok Sabha had prominent leaders like Pandit Jawaharlal Nehru, Lal Bahadur Sastri, Sardar Vallabhai Patel, Feroz Gandhi, Shyam Prasad Mookerjee, Kamaraj, Kakkan, S A Dange and many others. The First Council of States was constituted on 3rd April 1952. This is called Upper House. Dr S Radhakrishnan, then Vice President of India was the Chairman of the Council of States. The first sitting of this House also was held on the same day along with Lok Sabha ie 13th May 1952. Dr Radhakrishnan was holding the Chairmanship till 12th May 1962. On 23rd August 1954, Chairman made announcement naming this Council of States as 'Rajya Sabha' in Hindi. From that date, it is known as Rajya Sabha. This House has 238 elected members from various States and 12 nominated members. For Rajya Sabha Members, the term is 6 years. Every 2 years, one-third of the House retires and new members are elected. Hence, this is also known as Permanent House. Only Lok Sabha can be dissolved. Rajya Sabha is not dissolved. Shri S V Krishnamurthy Rao was the Deputy Chairman. Mr N Gopalaswamy Ayyangar was the Leader of the House then. As per the records, only two MPs, who were part of the First Lok Sabha are living now. Mr Rishant Keising (Manipur) and Mr Resham Lal Jangde (Chattisgarh) are the only two surviving MPs of First Lok Sabha. Mr Rishant Keising is now a sitting MP of Rajya Sabha. It is said that Rajya Sabha Secretariat is not able to locate anybody who was part of the Rajya Sabha then. President of India will be honouring these two members on 13th May 2012 in the Parliament House. Let us all join together to salute the great founders of our Nation and Constituion. On this happy occassion, we will greet the Parliamentarians and the great Institutions. Let us work for strengthening the democracy. Great knowledge...thanks for sharing with us. a great article about indian parliament....got a nice concept about indian parliament. From 2012, the Foundation has named this award as 'Sansad Ratna Award'.